A layer with a carrier medium, whereby at least one antimicrobial active agent has been assigned to the carrier medium, is, in order to achieve the aim of obtaining a layer that demonstrates a high reactivity of the antimicrobial active agent, characterized by an agent that is colloidal and/or nanoscalar. The layer is furthermore characterized by an agent in a layer broken up at least partially into sections or made up of partial layers that do not interlock. The invention also relates to the use of the layer as a cleaning article or in a cleaning article. The invention relates to a sheet comprising a carrier medium wherein the carrier medium is assigned at least one antimicrobial agent. The invention further relates to the use of a layer as a cleaning product or a cleaning product. From the prior art document and cleaning products are known which comprise a carrier medium, which is assigned a antimicrobial substance. In this case, an antimicrobial substance has antibacterial, antiviral, antifungal and / or against spores. However, the known layers or cleaning products comprise with respect to the reactivity of the antibacterial and / or antimicrobial agent considerable disadvantages. The known loadings of anti-microbial agents prevent rapid availability of the antimicrobial agent because its molecules are often not fast enough mobilized. This is due to that the molecules of the substance are present in a bulk phase and are shielded by surrounding molecules. This problem occurs in particular when coatings exceed a critical thickness and areal extent. The invention is therefore based on the object to provide a layer of the aforementioned type, which is distinguished by a high reactivity of the antimicrobial agent. According to the invention, the foregoing object is solved with the features of claim 1. Thereafter, the pulp antimicrobial is present in colloidal and / or nanoscale. In the present invention, it has been recognized that a colloidal and / or nanoscale present substance shows a very high reactivity, if the substance with bacteria, viruses, fungi, or spores is placed in contact. Furthermore, it has been recognized that the situation of the present invention releases the acting substance very easily to media which come into contact with the sheet. In that regard, the situation according to the invention is distinguished with respect to the antimicrobial substance by a high output capability. Colloids are disperse systems in which substances are dispersed in a dispersion medium so that whose particles, at least in one spatial direction have an extension of 10 to 1000 angstroms and composed of 10 3 to 10 9 atoms. Nanoscale structures are understood areas of any morphology that comprise at least in one spatial direction dimensions in the nanometer range. In colloids is an intermediate state heterogeneous and homogeneous mixture. The ratio of interfacial surface area to volume is very high in colloidal and nanoscale structures, whereby a high reactivity is ensured. The colloidal dispersion also allows for easy diffusion or dissolution of the particulate matter from a carrier medium. In that regard, the fabric antimicrobial can exhibit high mobility and neutralize bacteria, viruses and spores effectively and rapidly and kill them. Consequently, the aforementioned problem is solved. By suitable variation of the process parameters during the application of the substance whose morphology can be affected. In particular, the particle shape, particle size, layer thickness and the degree of occupancy of the antimicrobial agent can be adjusted by subsequent treatment of the deposited material particles. In that regard, the temporal release profile and thus the reactivity of the antimicrobial agent can be precisely adjusted. The substance could be distributed in the carrier medium. Here could be coated with the substance, the entire effective surface area. In this way is advantageously realized that the substance antimicrobial is homogeneously distributed over the entire sheet. This causes the fabric at all interfaces able to take effect. The substance could be distributed in a layer applied to the carrier medium layer or be associated with such a layer. It is conceivable that the substance is distributed in the carrier medium both colloidal and the carrier medium is further provided with a coating comprising the material in colloidal or non-colloidal state. By this combination a particularly long-lasting antimicrobial effect of the situation can be realized, since first the substances from the carrier medium can be effectively before the coating is removed. As a layer for example, could serve a printing paste. The provision of a printing paste allows a particularly cost-effective production process. In this way, be effectively avoided litigation costs as they arise, for example, the evaporation of the acting substance. The layer could be at least partially interrupted or consist of non contiguous layers. In contiguous layers of the fabric due to closed surfaces can not be sufficiently mobilized and therefore does not exhibit its reactivity free. By interruptions of the layer edge portions on which the fabric antimicrobial is significantly more reactive and thus quickly mobilized arise. The formation of sub-layers causes beyond a plurality of edges and fissures where the described effect may occur. To avoid repetition in terms of inventive step, reference is made to the above explanations. The layer or sub-layers may be formed as island structures. The formation of island structures could be achieved by an S sputter deposition. In this method, a substrate is brought into the vicinity of a target, so that condense out of the target whipped atoms on the substrate and can form a layer. In the ejected atoms is atoms of the antimicrobial agent. By this method, island-shaped patterns can be formed. The islands cluster or mono clusters form. This island structures show in its entirety a very large surface area to form a plurality of edges in which the molecules or atoms of the antimicrobial agent can be mobilized quickly enough to act, for example, bacteria change and neutralize or kill. Against this background, the layer is also conceivable to apply by means of a silver-containing printing paste. Here could include a silver dispersion, the printing paste. This concrete embodiment allows a cost-effective application of patterns, letters or symbols in order to give the consumer an indication of the technical use of the location. Letters, symbols or patterns often have to be installed to display its intended use. By using the printing paste or silver dispersion no separate coating of the position is necessary, since the patterns or symbols can itself act as antimicrobial layer. Furthermore, it is conceivable that the application of the layer is carried out wet-chemically by impregnation with a silver precursor and subsequent conversion of the precursor to metallic silver. As a silver precursor silver nitrate can act (AgNO3), silver sulfate (AgSO4) 2, organometallic complexes or metallocenes. The use of this silver precursor allows a locally selective creation of zones and areas, optionally through masks or stencils, in which the silver is present metallic. is located in the remaining areas, optionally after removal of a mask or stencil, still the silver precursor before. Furthermore, it is possible to impregnate a sheet having a silver dispersion or a cleaning lotion, which comprises a silver dispersion. The impregnated sheet may then be dried or be used in a wet state, for example, as a disposable cleaning article. The impregnation provides an inexpensive and rapidly operable method of depositing silver on a layer. The layer or sub-layers could have a thickness of 0.05 to 1000 nm. This thickness range has been found to be particularly advantageous in order to achieve sufficient mobility of the atoms or molecules of an antibacterial and / or antimicrobial and antimycotic substance. Against this background, the layer or sub-layers may have an areal density of 5 - having 1000 mg / m 2. This loading is just enough for a few applications capable so that it can be used as disposable or disposable. Furthermore, it is conceivable to use a material loading of up to 10,000 ppm (mg / kg) provided on a carrier medium. The carrier medium could have fibers. In this way, the carrier medium is a fissured surface for the addition of anti-microbial agents are available. Thus, layers of the acting substance, which are stored on the carrier medium are subjected to a fracture. Against this background, the acting substance individual fiber types could be increasingly associated with other types of fibers have a significantly lower consumption by the acting substance. This allows the Zerklüftungseffekt is enhanced. In concrete terms, could the nanoscale and / or colloidal structures of the substance preferably hydrophobic, in particular polyolefinic fibers of a non-woven fabric are deposited, said hydrophilic, especially viscose fibers, which might be substantially-free. This makes it possible to selectively attach to a nonwoven fabric which comprises a fiber mixture on a special type of fiber the effective material. The ruggedness of the material layer or material availability is then obtained by the fiber structure of the carrier medium. The carrier medium could include a nonwoven fabric. The use of a non-woven fabric allows the adjustment of the porosity by appropriate selection of fiber density or fiber thicknesses. It is conceivable that the nonwoven fabric is constructed of nanofibers, which ensure a very small pore size. Nano fibers typically have a diameter which is smaller than 1 micron and preferably between 50 and 500 nm. By using nanofibers of Zerklüftungseffekt described above can be further increased. In addition, nonwovens are characterized by a high absorbency and can therefore act as cleaning cloths, which absorb fluids. In particular, such cleaning wipes could include multi-layer non-woven fabrics, each layer may have a different pore size, a different fiber material or a different average fiber diameter. In concrete terms, could comprise at least one layer split fibers. This type of fiber can be split up by water jet treatment problems and / or solidify. At least one layer could comprise staple fibers or continuous fibers. These fiber types can be solidified by water jet treatment problems and / or devour each other. The carrier medium could include polymers. Against this background, in particular conceivable that thermoplastics such as polypropylene, polyethylene or polyester and polyamide be used. These materials are particularly suitable for the production of fibrous non-woven fabrics, since the existing of these polymers fibers fused together by thermal action, and thus can be firmly connected. This allows for the consolidation of knitted from fibers. Polypropylene and polyethylene are particularly suitable for deposition of silver. Silver can be easily deposited on polypropylene or polyethylene and enters into a firm connection with these materials. In particular by sputtering to silver can easily be deposited on these materials. A solid bond is obtained by Van der Waals force or a chemical bond. By applying thermal or plasma treatment of polypropylene and / or polyethylene whose surfaces are activated and improves the adhesion of silver on the surfaces. The carrier medium could be designed as a reusable latex glove. This configuration advantageously allows the use of existing products and their cost equipment with anti-microbial agents. The carrier medium could include chitosans and / or cyclodextrins. These materials have been found to be particularly suitable for the storage of colloidal silver and other substances such as fragrances. Against this background, the carrier medium fragrances could be associated. In this way, bad smells can be neutralized, absorbed or suppressed or masked. The chitosans and / or cyclodextrins can be loaded with silver and / or fragrances and fixed on the actual transfer medium. The chitosans and / or cyclodextrins permit specific and long-lasting delivery of embedded colloidal silver or of stored perfumes. Metallic silver, which is not present in ionic form, could be deposited in sheet silicates or zeolites. It is advantageous that the silver is in the form of Nanoclustem may be in the channel structures of the layered silicates or the zeolites. At the edge of the channel structures of silver oxide is first formed, which will diffuse away and converted to ionic silver. Then the next layer is converted to silver oxide of a nanocluster, wherein the process described above repeated. Channel diameter differently sized clusters of metallic silver may arise. In that regard, a polymodal distribution of nanoscale silver structures within a layered silicate is possible. Against this background, it is conceivable that colloidal silver is incorporated into channel structures next to the scent molecules, which is released similarly to the fragrances and can exert its antimicrobial effect. It is also conceivable that is stored instead of scent molecules colloidal silver in the cyclodextrins and chitosan. In this configuration, it is possible that silver leaks and odors through the resulting gaps in the cyclodextrins and chitosans are trapped in return. This configuration allows a saving of expensive perfumes. Test series demonstrated that there is a ranking of the materials used in terms of antimicrobial activity. This can be illustrated as follows. Silver is the most effective substance, followed by mercury, copper, cadmium, chromium, lead, cobalt, gold, zinc, iron, and finally manganese. Against this background, it is conceivable also to use main group elements which show an antimicrobial effect. The fabric antimicrobial could be a gold-silver mixture or consist solely of a gold-silver mixture. Mixtures of this type show particularly high antimicrobial efficacy. It has surprisingly been found that the presence of gold, the antimicrobial action of silver still increases. Against this background, it is conceivable to dope silver with gold. It is also conceivable to form islands or clusters, but comprise only either gold or silver only mixtures of these substances. Creating islands or clusters of different compositions can be present side by side. The substance could be added to aluminum. Aluminum results in the long term a brightening and / or an improved appearance of the coating, as for example, silver becomes brown due to oxidation processes. This results in an unsightly appearance of the coating or of the entire location. Aluminum causes further modification of the release rate of the antimicrobial agent. The fabric could be the subject of a supported system. By this, a system is meant in which the antimicrobial material actually carrier substrates is assigned. The carrier substrates blacks or oxides can include. By the addition of solid particles to carrier substrates, it is ensured that the individual particles do not agglomerate. Thereby, the reactivity of the acting substance is significantly improved. The carrier substrates themselves can be associated with the actual transfer medium. Ultra-high vacuum - is reached. Thereafter, it is usually argon admitted and ignited by various methods of energy input such as microwave, high frequency, electric discharge, a low-pressure plasma by means of valves, a working gas. The above-mentioned object is achieved further by the features of patent claim 18. Cleaning cloth as disposable cleaning cloth is particularly cost-effective since the usually very expensive antimicrobial substances can be applied extremely small doses. Disposable cleaning cloths have over multiple Reinigungstüchem the advantage that they can not form Kontaminierungsherde after a single use, as they are disposed of immediately after use. Multiple wipes are more expensive than disposable cleaning cloth, as they comprise more substance antimicrobial. Nevertheless, multiple can not be used in proportion to the amount of the antimicrobial agent for longer cleaning cloths, as they are no longer functionally used frequently due to contamination after a relatively few cycles of use. The location could be used in floor cleaning and / or disinfecting the soil. Against this background, it is conceivable that the situation is used in a mop. A mop comprising mostly textile strips, which serve to receive liquid. These strips could be formed by the novel materials. This concrete embodiment allows the use of the antimicrobial agent in hospitals, nursing homes and other places, such as in large kitchens, in which bacteria can form on the floor in an undesirable manner. Furthermore, it is conceivable that the location is embodied as a nonwoven fabric, woven fabric, knitted fabric or as yarn. The use of a nonwoven fabric in view of an adjustable porosity of advantage. Woven and knitted fabrics are characterized by a high mechanical stability, and may have a mixture of different fiber types. The use of different types of fibers, namely fibers of different materials, allows for the selective attachment of the substance acting on individual fibers. Yarns are of advantage, if the position in the mop, especially Schlingenmopps, is used. The yarns in this case replace the strip described above. Packaging film is designed for food. The coating of the layer with antimicrobially active substances allows effective repression of the formation of bacteria which may spoil foods. Furthermore, it is conceivable that the carrier medium is designed as a foam body. When using an open-cell foam is even conceivable that the interior of the foam body is impregnated with the antimicrobial substance. The scene mstoffkörper could be used as a cleaning sponge. This ensures that absorbed by a foam body fluid is disinfected or that which takes place in her growth of bacteria is inhibited. This is advantageous if the foam body comes as a sponge in food-related areas such as counters or tables in restaurants used. Depending on the application hygienic conditions can be easily improved, ie bacterial growth can be suppressed or be achieved in an extreme case, a bacteria killing. The principles described here can be used in virtually any hygiene or beauty products because of their antimicrobial activity. Here, especially baby wipes, diapers, wipes, facial tissues or products for incontinence patients are conceivable. And suppression of biofilm formation in water treatment can be achieved with these materials. It is also possible to use the principles described here as filters in air conditioning or ventilation systems. This would help harmful pathogens and germs are effectively reduced or even removed in the breath. When one combines the advantageous antimicrobial properties of silver with properties of nanoscale systems, there are novel material properties which are mainly attributable to a high surface / volume ratio. The microbiologically effective silver ions are formed as silver on the nanoparticle surface by the action of atmospheric oxygen and moisture from the environment. The oxide layer itself has independent of the particle size to a substantially constant thickness. This means that the proportional share of the total volume of microbiologically effective volume with decreasing particle size increases significantly. As far as silver is present nanoscale now arise significant advantages. By finer representation is required much lower amounts than would be required if one uses roughly divided silver. The larger surface area / volume ratio of a significantly greater amount of silver is made available to the environment. This ionic silver can be mobilized more quickly. This gives a true depot effect of a long-lasting effect guaranteed. With nanoscale silver materials can be provided that would otherwise be inaccessible to Silver equipment. So coarse silver particles can not be spun in all polymer fibers, for example, because the nozzles are clogged. Applying nanoscale silver to a substrate surface and indeed chemically or by vapor deposition. Since the silver here sits on the surface, it may appear very rapidly. In addition, you can set the silver release profile very well by the morphological design (shape, size) of the silver nanostructures. In a Eincompoundierung of nanoscale silver silver nanoscale compounded simultaneously with other fillers. Depending on the hydrophilicity of the polymer concentrations of 500 can here - 2000 ppm silver to a sufficient effect may be necessary. However, here is a portion of the silver in the volume is still not accessible. In addition, the effect is delayed because the silver has to diffuse to the polymer surface only. There are various possibilities for embodying and developing the teaching of the present invention advantageously. For this purpose, on the one hand to the claims subordinate, on the other hand, to the following explanation of preferred embodiments of the teaching of the invention with reference to the tables. Table 4 shows the killing rate of bacteria on glass sheets. On layers consisting of support media of nonwoven fabric having a basis weight between 50 and 500 mg / m 2, different silver loadings were applied by a magnetron sputtering process. The nonwoven fabric comprises polymeric fibers. The nonwoven fabric further includes natural fibers, namely cellulose fibers. In concrete terms, nonwovens were used that contain rayon, polypropylene and Polyethylenteraphtalatfasern in mixture. Sample 2 has a silver loading of 10.5 mg / m 2. The samples 3 to 6 each have 29.4; 56.7; 115.5 or 231 mg / m 2 of silver loading. Sample 1 includes no silver loading and constitutes a so-called zero sample. The carrier medium comprises as antimicrobial active substance of silver that is present in colloidal and / or nanoscale. This is caused by the generation of essentially cuboidal nanoparticle island structures of silver with an edge length in the range of 5 nm. The island structures formed on the transfer medium have a specific surface area that is greater than the surface Nano a closed layer having a thickness of 5 nm. Therefore, the discharge rate of a carrier medium, which comprises rectangular island structures with an edge length of 5 nm, much faster than that of a fully coated carrier medium. The block-shaped island structures were detected by SIMS. In concrete terms, it has been demonstrated that the nanoscale and / or colloidal silver structures are preferably deposited on the polyolefinic fibers of the nonwoven fabric used. The viscous fibers are largely free from silver. This makes it possible to selectively attach to a nonwoven fabric which comprises a fiber mixture on a particular fiber type silver. the size of the islands, and the width can be controlled size distribution by suitable variation of the process parameters and the load. In this way, the specific surface area and thus the release profile of the antimicrobial silver is adjustable. polymodal distributed nanostructures are concretely be generated by tuning the process parameters. These each have a different high number of unsaturated surface atoms. In this way, they have different levels of reactivity and microbiological activity. The samples 1 to 6 were subjected to a test for antimicrobial equipment according to the generally known method AATCC-100, which finds application in the textile materials. The results of this test are shown in Table 1 below. 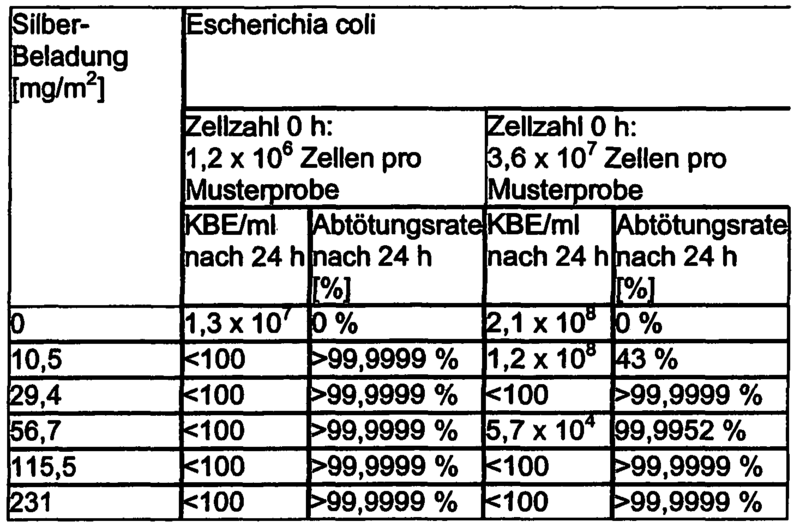 Table 1 shows the rate of kill of Escherichia coli - cells as a function of silver loading. In Table 1 in the first column, the silver loading is plotted in mg / m 2. The second column of the table shows the number of bacteria in the unit CFU / ml (colony forming units / ml) after 24 h. And the third column, the kill rate after 24 h. In percent. The fourth and fifth columns are constructed analogously. 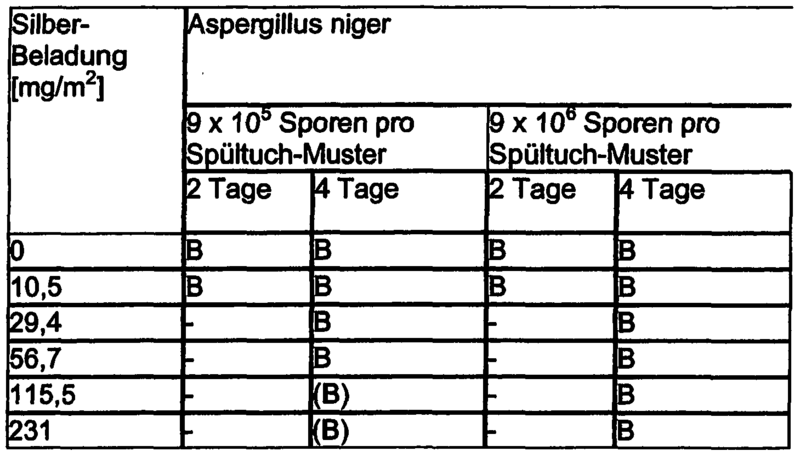 Table 2 shows the results of microbiological tests, which was carried out with spores of Aspergillus niger type on the samples 1 to. 6 The samples 1 to 6 functioned as a pattern for this Spültücher (dishcloth pattern). Peritonitis, inflammation of the endocardium, diseases of the nails and skin infections. The first column of Table 2 shows the silver loading in mg / m 2. The second column gives the size of B to qualitatively whether the particular sample is covered with spores after two days. The third column indicates analog, whether the sample is covered by four days. (B) merely presses of high that the fouling is somewhat weaker. The dash (-) is high that no growth is present. The samples 1 to 6 of the test series 1 were further subjected to odor testing. For this purpose the configured as towels samples were stored at 32 ° C for 48 hours. In 100 ml of 10% lactic solutions. The samples were then removed and dried. The milk solutions and the dried and were coated with 100 ul water according to their drying rewetted samples olfactometrically evaluated. Table 3 shows the results of the evaluation. Furthermore, the rapid mobilization of silver ions has been demonstrated in Auswaschversuchen. The samples 1 to 6 with a size of 2.5 x 5 cm were water with pH values ​​of 3, stored for 7 and 11 and the silver concentration was determined in each case 100 ml. It was found that within the first hour of the storage period, the release rate is greatest. The antibacterial effect is very rapidly effective, so that even a complete killing of bacteria can be achieved after 24 hours.. Nevertheless, a moderate discharge is also observed after the first hour, which also ensures a medium- to long-term effect. In another test, a reference sample having a silver loading of 55 mg / m 2 subjected to two full standard washes with a commercial washing machine and a commercially available washing powder. After the first wash were still about 30% of the silver on the cloth available. After the second cycle were still about 30% of the silver on the cloth available. After the second wash 17% for bacteria of the type Escherichia coli and 99.33% for bacteria of type Staphylococcus aureus killing rates could be detected on the cloth still up to 91. Table 4 shows the results of a test, were treated at the glass plates with different samples. Layers with a support medium made of nonwoven fabric were impregnated with a nano-silver dispersion. These sheets were used as wipes for disinfecting glass panes. In these layers is on the carrier medium prior to silver colloidally dispersed. The silver is homogeneously distributed in the carrier medium. For the preparation of these layers, a standard floor cleaner having a silver concentration of 500 ppm silver was first provided. This standard floor cleaner was applied on 10 x 10 cm samples which were. Overcoated overnight in a test tube at room temperature for about 17 hours. After 17 hrs., Each sample was divided. One half was squeezed out directly between two towels gentle, the other half rinsed for about 30 seconds with tap water without hard beam and then gently squeezed. All samples were of type A for 3 h then. Dried at 100 0 C in a forced air oven. Furthermore were wiped glass sheets with samples of type B (cloth) which has been vapor-coated with 120 mg / m 2 of silver. With samples of type A and B glass sheets have been defined and reproducible repeatedly wiped off. After that, a microbiological test was performed on the samples, and the mortality rate is determined. There were punched out 5 cm samples of types A and B and charged with 20 ml of water 2.5 x. The samples were back with 50 N normal force on 20 cm long and 5 cm wide sheets of glass in 50 cycles of oscillation to and fro. Standard floor cleaners were impregnated with a silver concentration of 500 ppm silver. In the observation of bacteria of type Staphylococcus aureus to a mortality rate of> 99.89% using the steamed sample showed. A kill rate of 99.93% could be detected when using the impregnated samples. Glass panes that were not wiped, did not kill rate, that on these sheets of glass were the bacteria in initial concentration rate available. Finally, it should be explicitly noted that the embodiments described above serve merely to discuss the claimed teaching, but do not limit it to those embodiments. 1st layer comprising a carrier medium wherein the carrier medium is assigned at least one antimicrobial substance, characterized in that the substance is present in colloidal and / or nanoscale. 2nd layer according to claim 1, characterized in that the substance is distributed in the carrier medium. 3. Location of claim 1 or 2, characterized in that the substance is a layer applied to the carrier medium layer is assigned. 4. Location of claim 3, characterized in that the layer is at least partially interrupted or is composed of non-contiguous partial layers. 5. sheet comprising a carrier medium wherein the carrier medium is assigned at least one antimicrobial substance, characterized in that the substance is in a layer which is at least partially interrupted or is composed of non-contiguous partial layers. 6. Situation according to claim 4 or 5, characterized in that the layer or the partial layers are formed as the island structures. 7. Situation according to any one of claims 4 to 6, characterized in that the layer or sub-layers having a thickness of 0.05 to 1000 nm. 8. Location of any of claims 4 to 7, characterized in that the layer or sub-layers have a surface density of 5 to 1000 mg / m 2. 9. Location of any one of claims 1 to 8, characterized in that the carrier medium comprises fibers. 10. Location of claim 9, characterized in that the material acting individual fiber types is increasingly associated with other types of fibers have a significantly reduced or no coverage by the acting substance. 11. Location of any one of claims 1 to 10, characterized in that the carrier medium comprises a nonwoven fabric. 12. Location of any of claims 1 to 11, characterized in that the carrier medium chitosans and / or cyclodextrins are assigned. 13. Location of any of claims 1 to 12, characterized in that the carrier medium are associated with perfumes. 14. Location of any of claims 1 to 13, characterized in that the antimicrobial substance includes silver. 15. Location of any one of claims 1 to 14, characterized in that the substance comprises at least one subgroup element. 17. Location of any of claims 1 to 16, characterized in that the material aluminum is added. 18. Use of a sheet according to one of the preceding claims as a cleaning product or a cleaning product.